Fancy a Taste of “Southern Hospitality” … Blend-style? Come to our Reno Bites Week Southern-Inspired Pop-up Paired Dinner–one of the tastiest pop-up events in Reno this week! As a highly mobile catering company in Reno, we love doing creative pop-up dinners around town–and not just because we don’t have our own space! It’s been such an honor to be embraced by the Reno-Tahoe food-loving community, and we have so much fun when we get invited to do something special to represent & celebrate our region’s culinary vibrance. 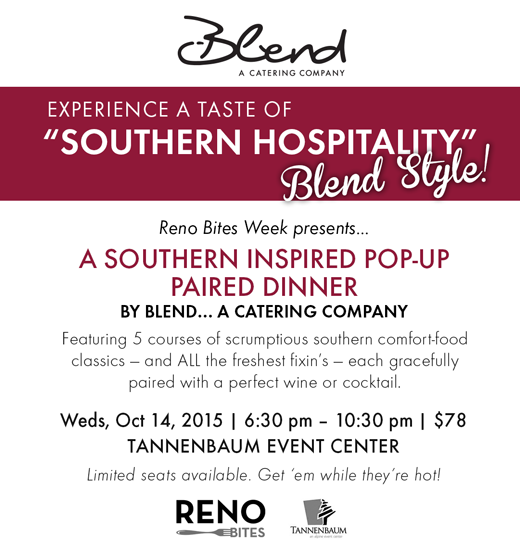 That’s why we’re excited that Reno Bites Week is featuring Blend to cook up a 5-course Southern Inspired Pop-up Dinner w/ exquisite cocktail and beverage pairings, with delectable dishes inspired by a road trip we took through the culinary heart of our country’s food-loving Southern region! Weds, Oct 14, 2015 | 6:30 pm – 10:30 pm | “Down South” of Reno at the always-stunning Tannenbaum – An Alpine Event Center. “Now in its fourth year, Reno Bites restaurant week is a citywide celebration of Reno’s distinctive culinary culture, with dozens of local restaurants offering specialty items, price points and signature events. “Created to encourage northern Nevadans to explore and patronize locally owned restaurants, plus foster community among local restaurateurs and chefs, Reno Bites is now in its fourth year boasting a larger array of participants and events. It’s an entire work featuring some of our area’s best restaurants, chefs, breweries and other local food industry stars, and we’re so happy to be considered right smack in the middle of them! But don’t you dillydally, shillyshally or lollygag about. Only a few dozen seats remain and they’re going fast … Follow the link to get ‘em while they’re hot! And please feel free to share our flyer (below) with every flavor-loving friend you know!